The very first event I went to in Louisville when we moved here more than two years ago was the annual Jane Austen Festival–the largest event of its kind in the country. Custom Wig Company goes every year. This year, though, the festival was postponed because the local chapter of the Jane Austen Society was hosting the Annual General Meeting, which we attended as well. 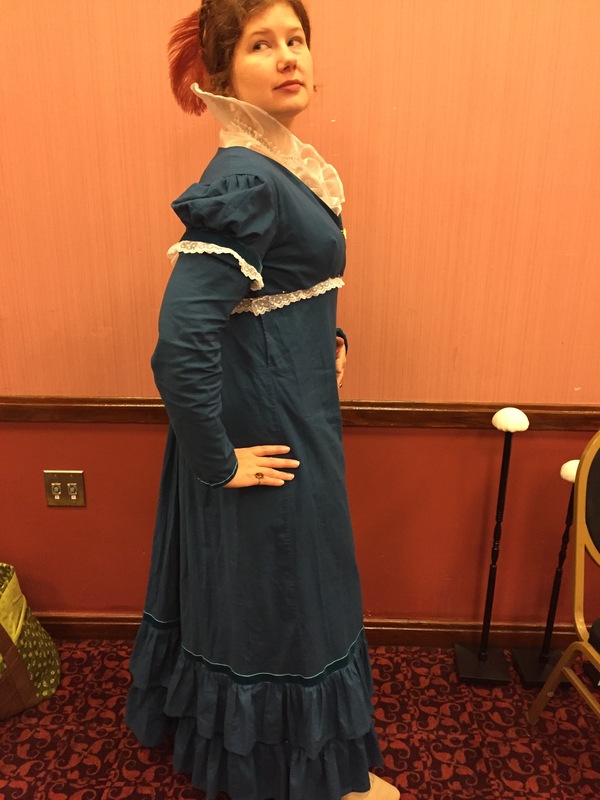 So this was the year that my boss decided to invest in her very own Regency outfit made by yours truly (she had been borrowing outfits up until now). After all, we are planning to expand the historical side of our business starting next year, so we’ll be upping our historical wardrobes as well as our cosplay ones. We’ve been discussing it and decided that the only reasonable solution to our growing wardrobes is to buy a beautiful Victorian mansion just to keep all of our clothing in. We didn’t copy this outfit exactly, but we used many of the details for inspiration to create a single dress, rather than a dress and spencer. 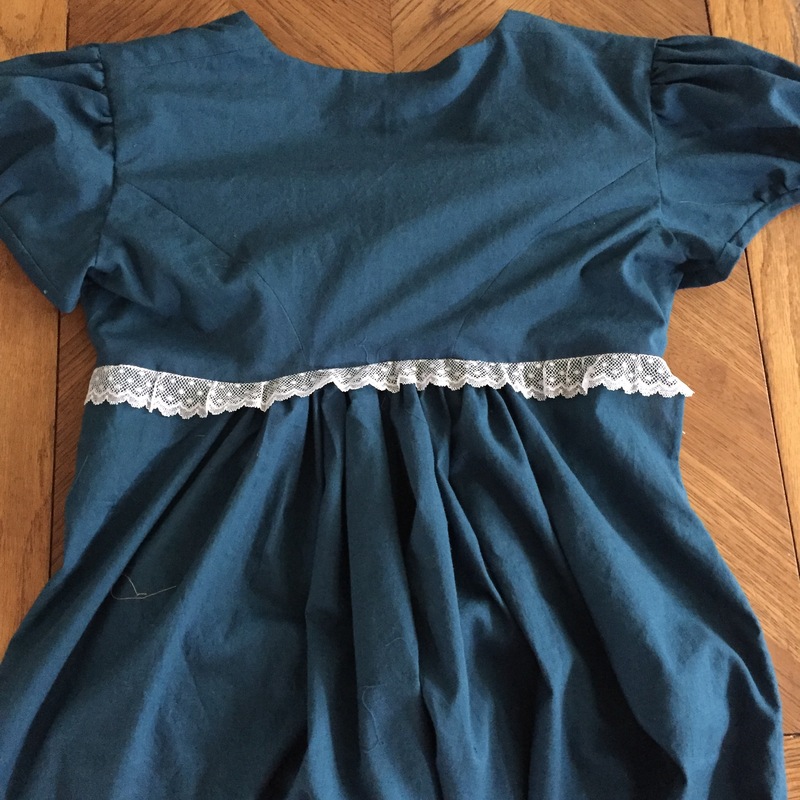 In order to mimic the front-closing V-neck of the inspiration image, the dress has an apron front with a cross-over bodice, meaning that the bodice is attached to the skirt at the back, but not in the front. 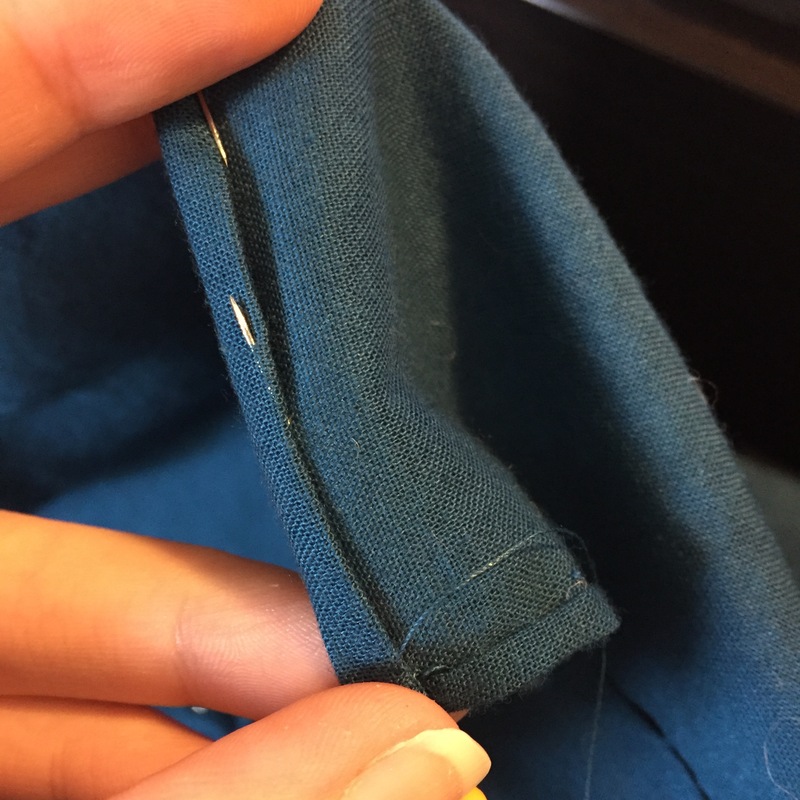 This opening allows the dress to be put on without needing a split down the back. 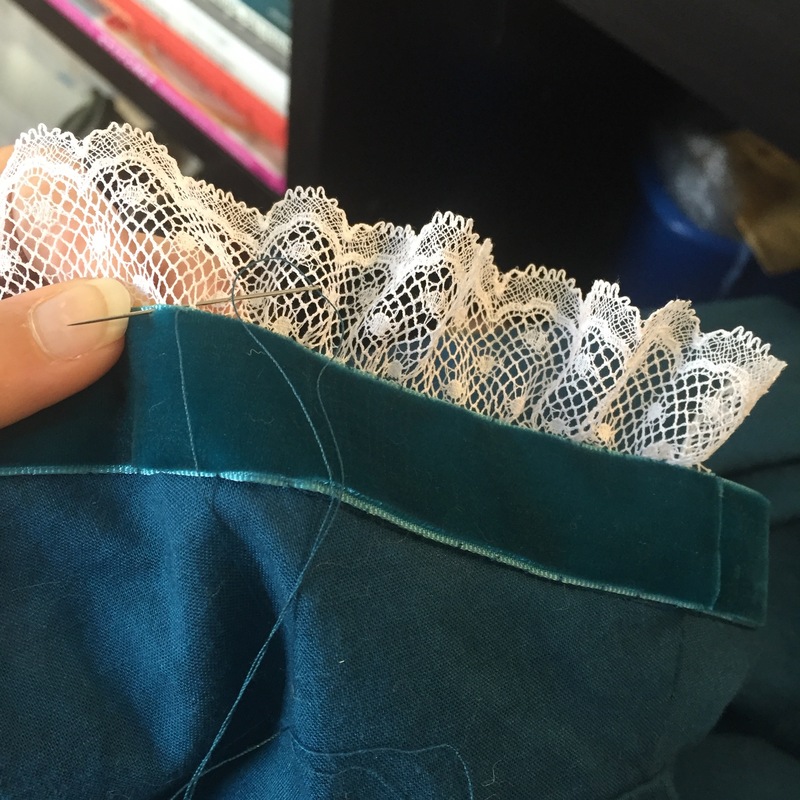 The bodice is then pinned to the skirt at the front to keep everything together. 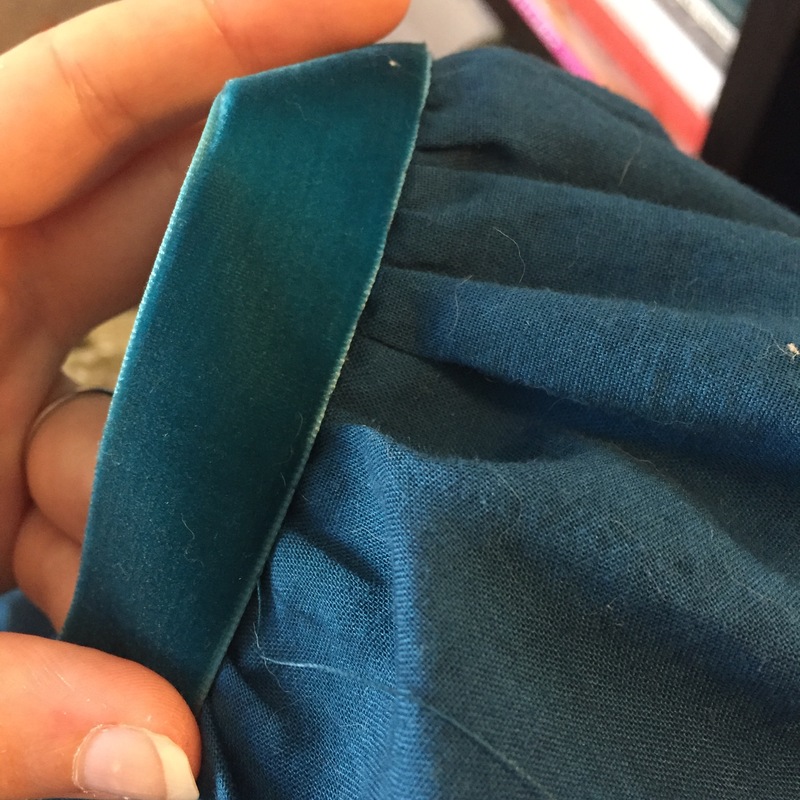 This kind of closure was very common in the period–you can even see the pin-marks on some extant dresses! Since an under-bust sized opening wouldn’t be enough for anyone to fit through, the skirt is open a bit on each side. When the dress is on, a hook and eye at the top of each slit keeps everything proper. 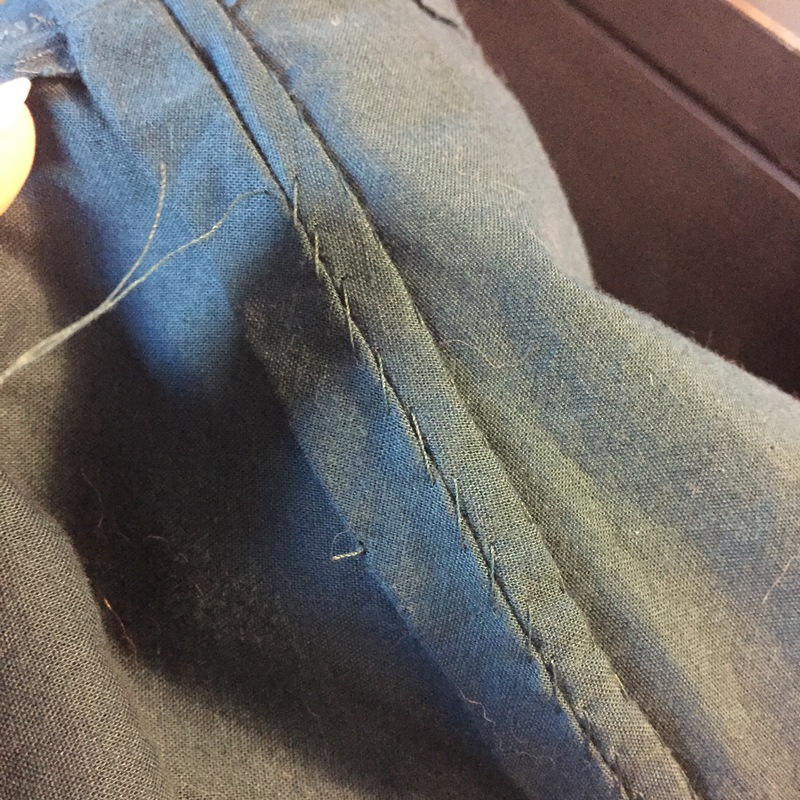 The seams below the slits are flat-felled–meaning they are finished by trimming one side of the seam allowance short, then folding the other over it and securing it to the skirt with a slip stitch. 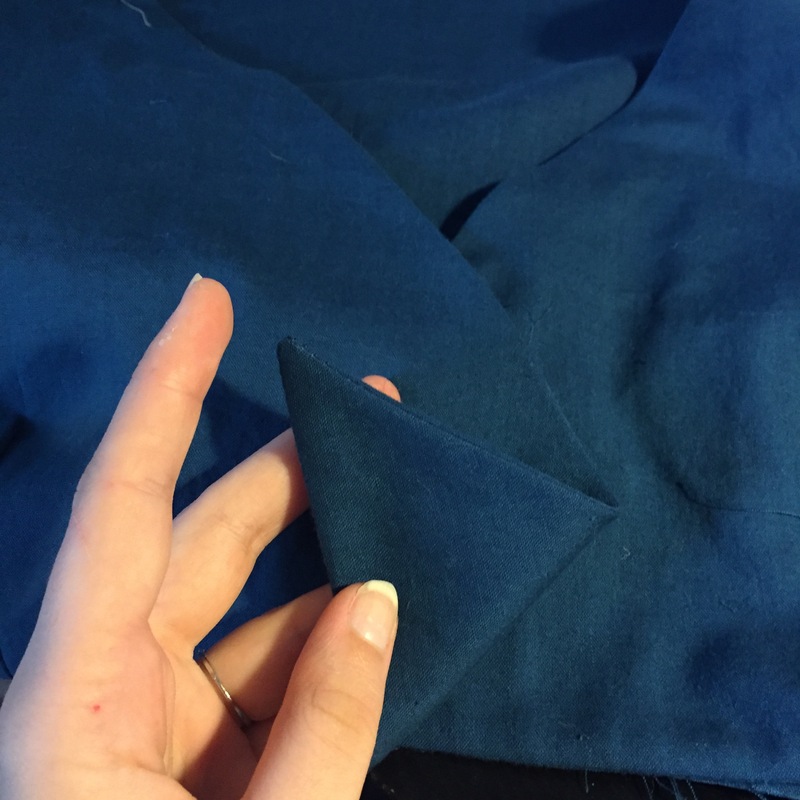 This encases the raw edges and keeps the seam nice and flat. I had a picture to show you what I mean, but, as it sometimes does, WordPress decided it had something against that picture in particular. 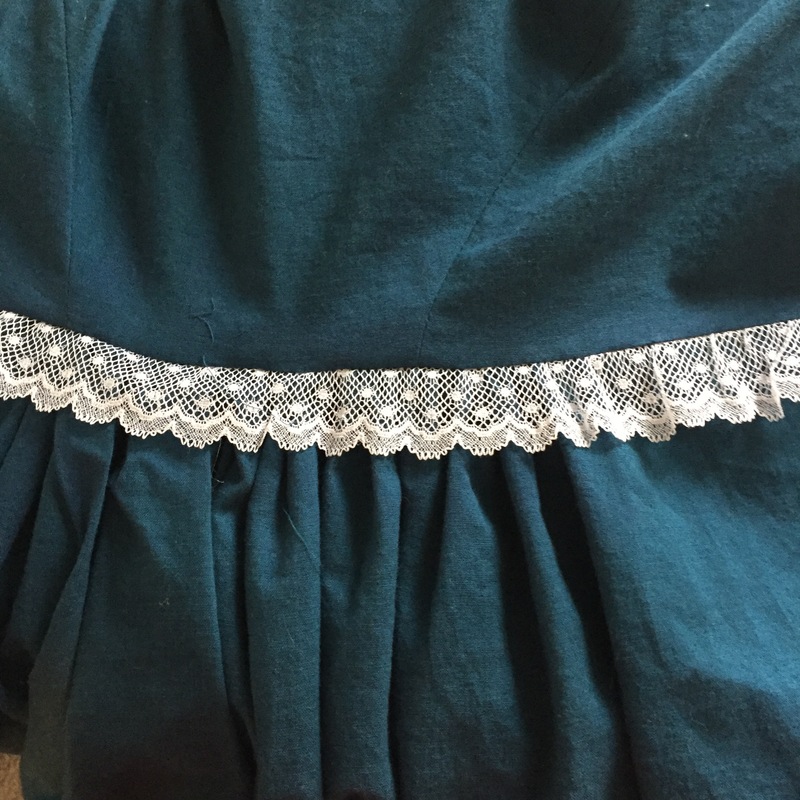 I put the lace along the waist in two pieces. 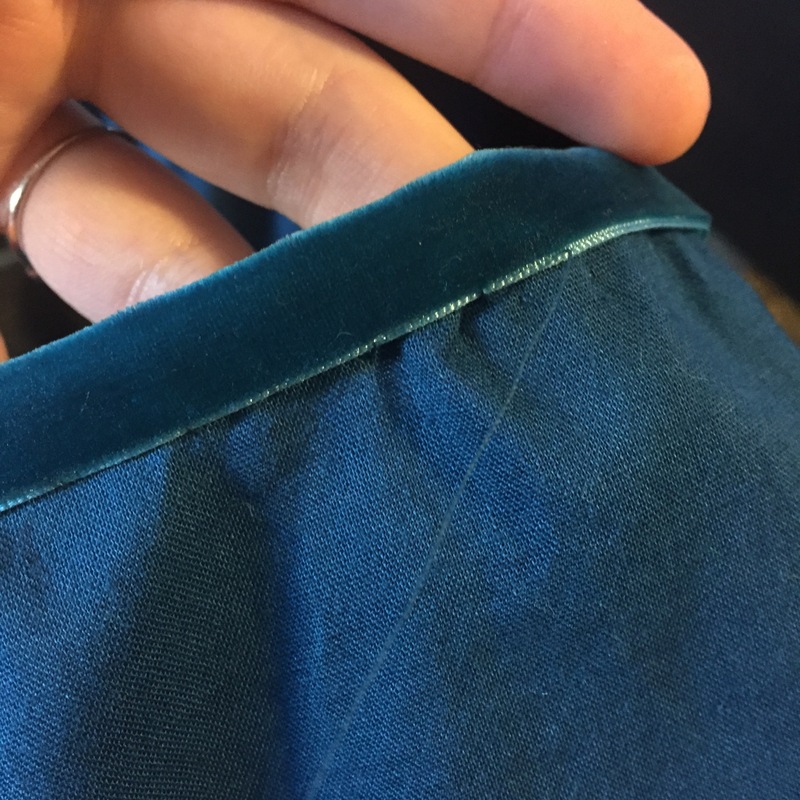 Technically I could have put it all along the bodice edge in one piece, but I decided that I would rather have it on the skirt front, so that it wouldn’t get in the way while pinning the bodice. 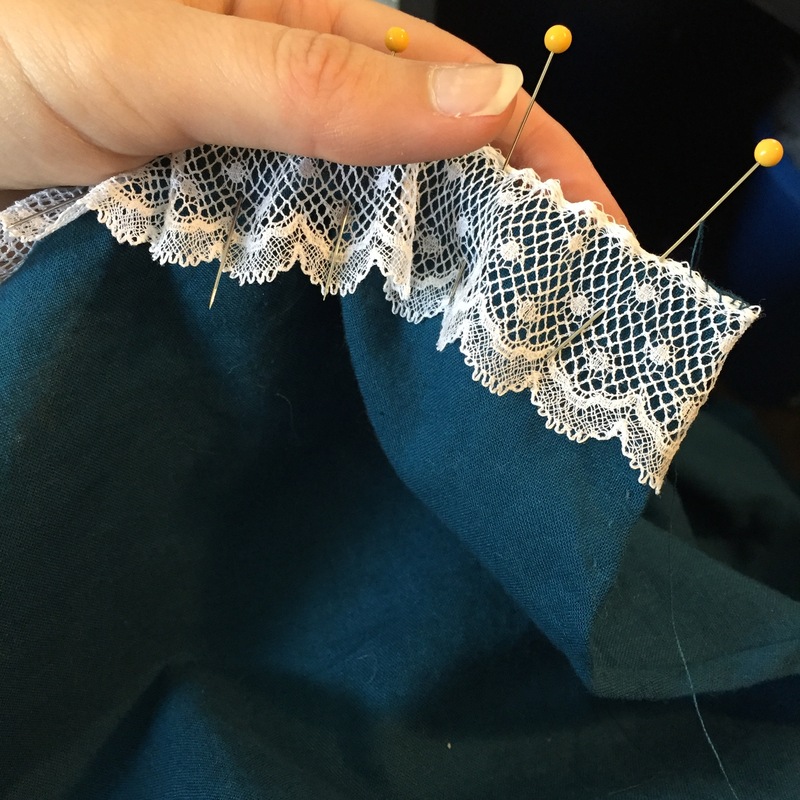 In the back, the lace was basted just inside the bodice seam allowance, then the skirt gathered on and stitched. 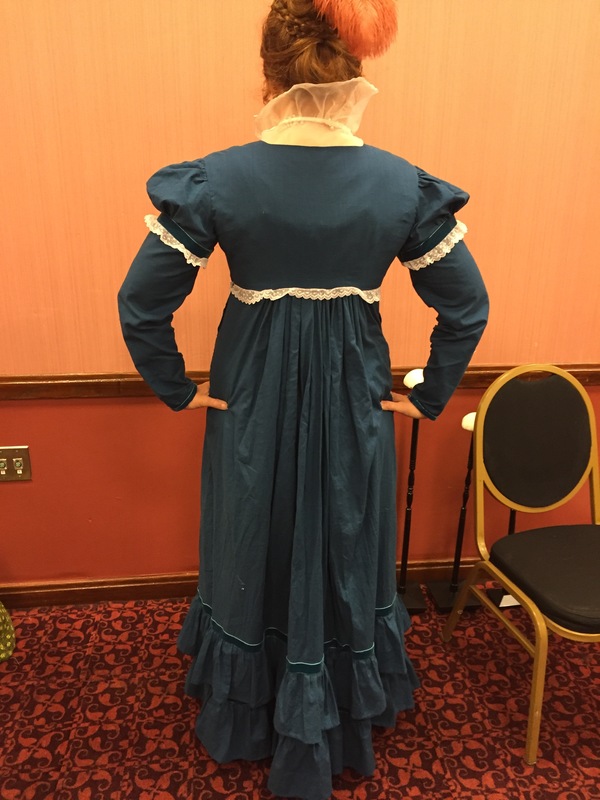 I love the way the back gathers look on a Regency skirt with no back opening! 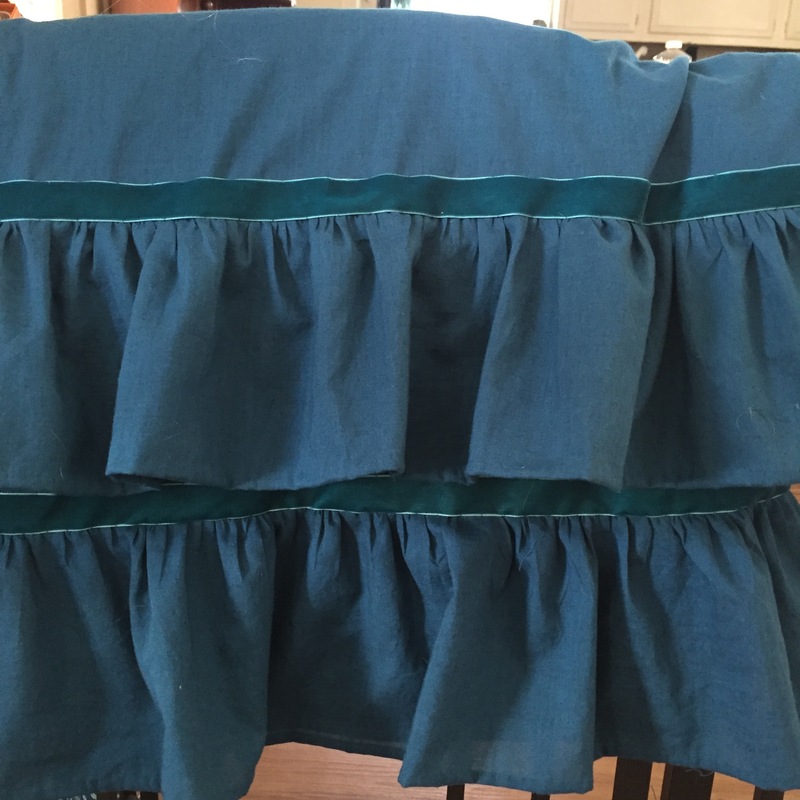 The top of the skirt front got a very narrow hem. 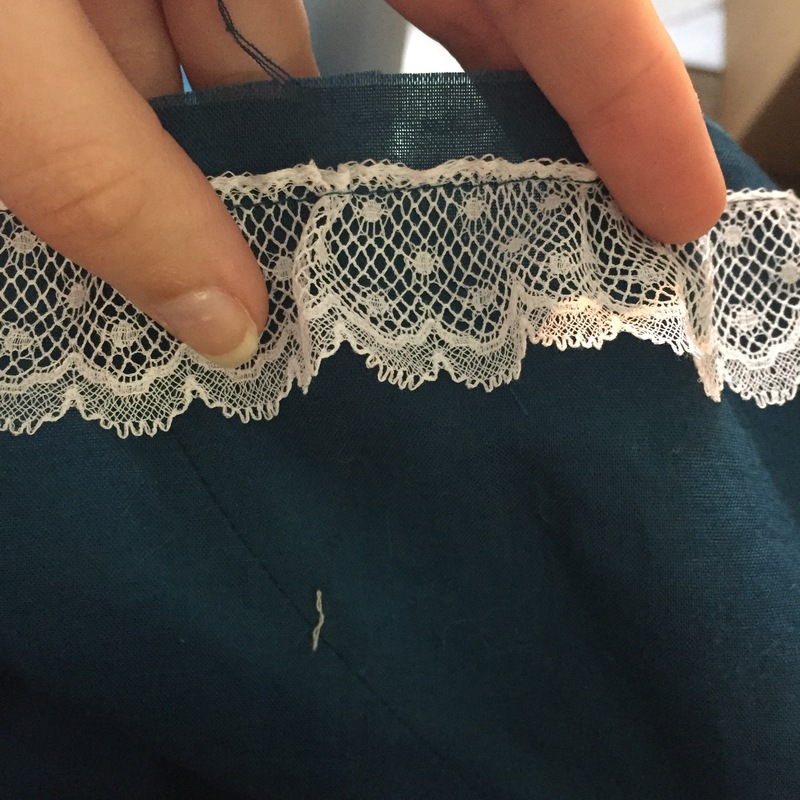 I then gathered the lace right along the edge and stitched it on. 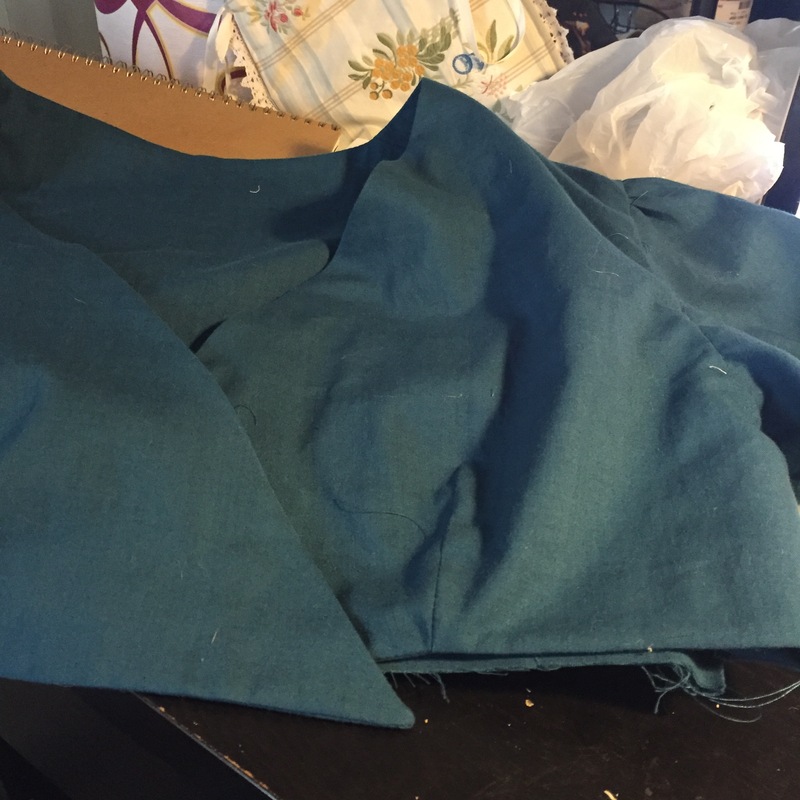 The top will be covered up when the bodice gets pinned on. The inspiration photo only shows the bodice, so I got to have fun on the skirt. Heather is the proprietress of our shop, so I wanted things to look elegant and sumptuous–I went with two deep (6 inch wide!) ruffles trimmed with matching velvet ribbon for depth of texture. 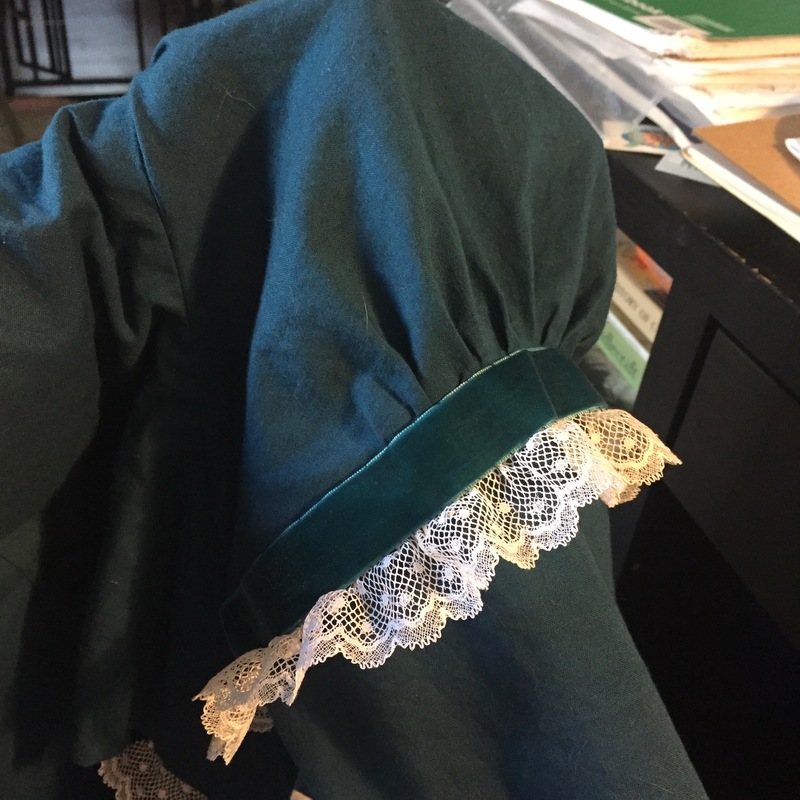 Ruffles lend weight to the hem of a gown, which helps it hang gracefully even without the aid of a petticoat–though we definitely plan to add one of those to her outfit in the future. 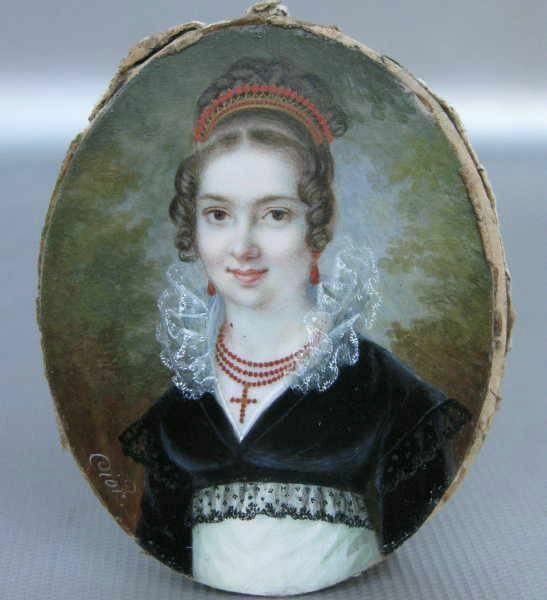 The woman in the miniature is wearing a spencer with lace trim at the shoulders. 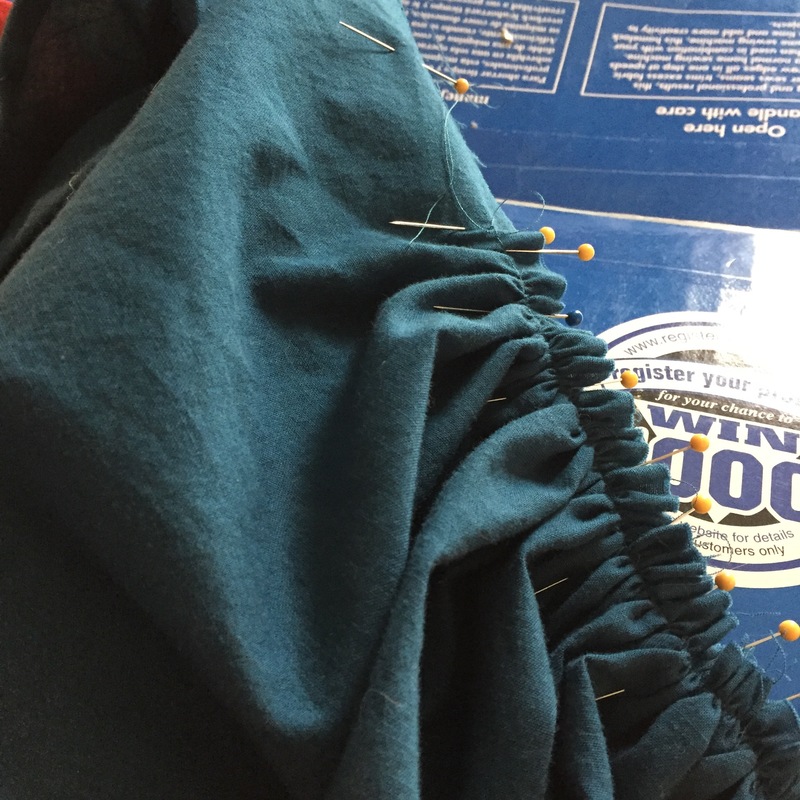 On Heather’s gown, I decided to do a short puff sleeve with detachable long sleeve instead, which makes the gown more versatile (the long sleeves are basted in and can easily be removed for evening). 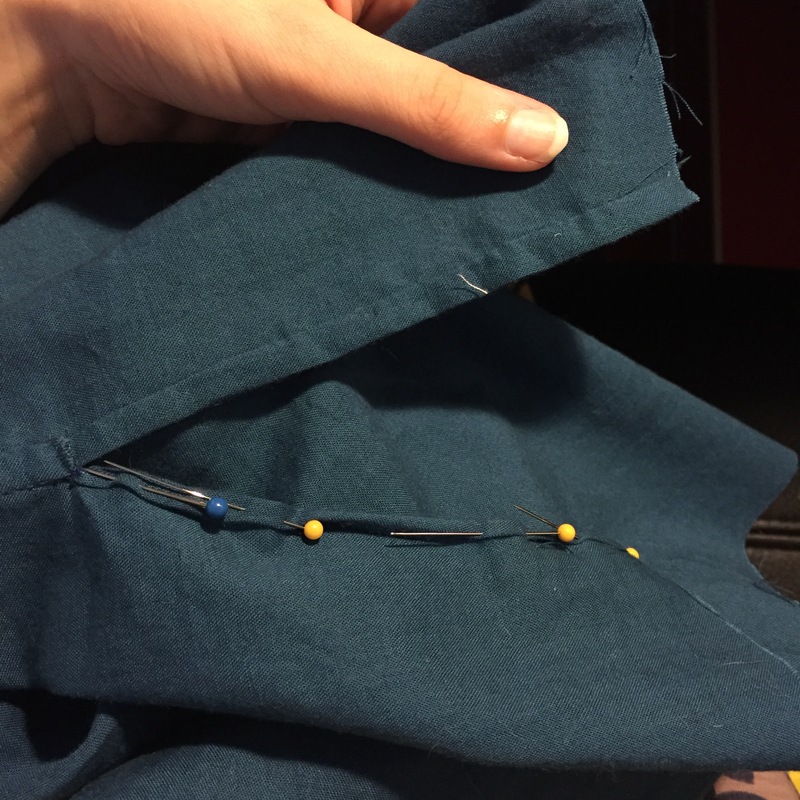 I put lace and more velvet ribbon around the band of the short sleeve, and velvet ribbon around the cuff as well. I just love velvet ribbon! It was so convenient how the room we were in was practically designed to show of the color of this gown. 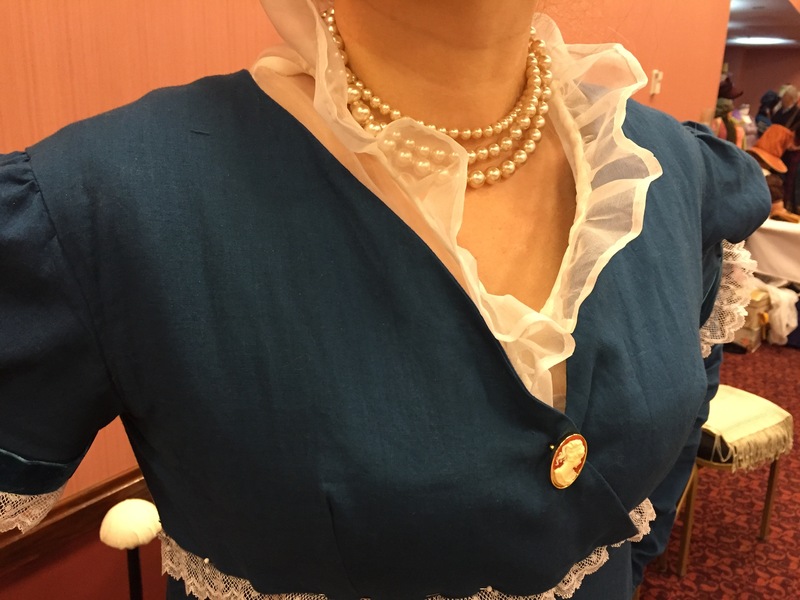 It even goes perfectly with her cameo brooch and feather! 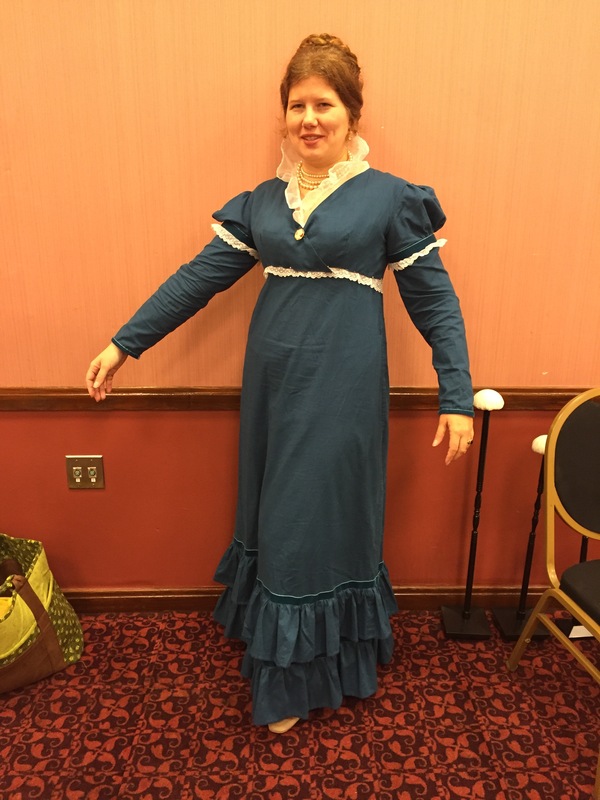 We had a blast at the AGM, and Heather is already making plans for her next Regency look. See you next time, when I will finally have completed the bonnet I said I was planning way back in my third ever blog post! Wish me luck with that!